You are here: Home / Hacks / bad.hack / God Hates…Nerds? 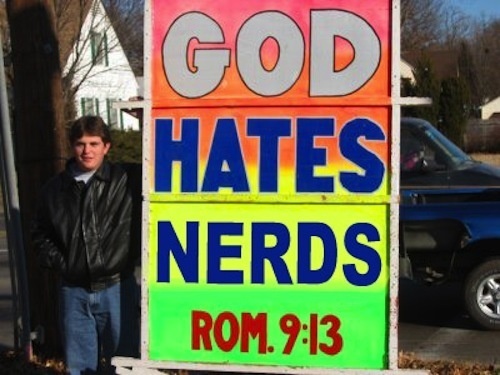 Apparently our friends at Westboro “Church” have ran out of social groups to protest and have moved on to…nerds. They are planning on protesting ComicCon (h/t Bilerico) this year. Seriously. Are you kidding?! If these people would spend even some of the energy that they spend on these comic books, reading the Bible, well no high hopes here. They have turned comic book characters into idols, and worship them they do! Isaiah 2:8 Their land also is full of idols; they worship the work of their own hands, that which their own fingers have made: 9 And the mean man boweth down, and the great man humbleth himself: therefore forgive them not. It is time to put away the silly vanities and turn to God like you mean it. The destruction of this nation is imminent – so start calling on Batman and Superman now, see if they can pull you from the mess that you have created with all your silly idolatry. If we were even taking this seriously, being an enthusiast (nerd) of a topic does not necessarily equal misplaced devotion. There are multiple motivators for becoming one, and multiple sustaining forces once nerd-dom has been established. More often than not nerdiness is an escape from reality or a relaxation from stress…and most likely, the stress itself is the idol. But while we’re talking about misplaced devotion, I’m calling pot and kettle here. If Westboro spent as much energy on reading the bible as they do making God look ugly, they’d be rockin’ scholars instead of the surface-level enforcers that they are. if they thought high school kids and liberal christians could get creative with counter-protests, wait until they get the bible quoted at them in Klingon. Or LOLcat. okay. going to church now, really. @billgepford, "God is great for turning trash into good manure for the spiritual growth of others"
That's my inspirational quote for the week! Excellent! The good thing about Westboro is that they provide the extreme example for Biblical fundamentalism. Why am I not a fundamentalist? Oh, yeah, now I understand. Here's photos from the counter-protest (some are very inappropriate FYI). First off, Westboro is still alive? Second, why are they still trying to stir up disunity among Christians? I am surprised by the abject lack of cultural awareness there are proposing (not to mention oldschool kjv, really?). There is a place for calling out unhealthy habits and addictions, but that should be contained within trust-based relationships. What expectation do they have for any real reception from nerds based on their delivery here – Christian or not?